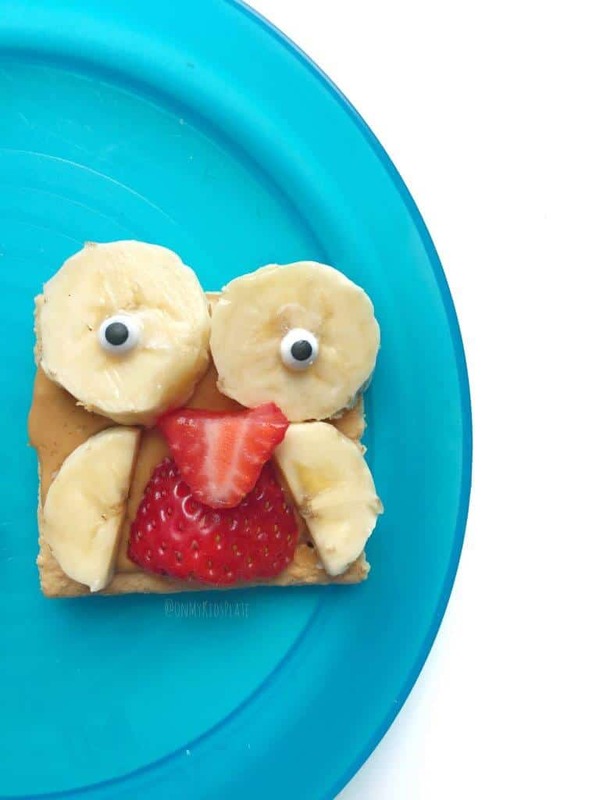 Whooooo’s hungry for a little peanut butter strawberry and banana kid’s snack? No need to sit owl by yourself, this is the perfect snack to pair with a friend, and a good glass of milk or water too. 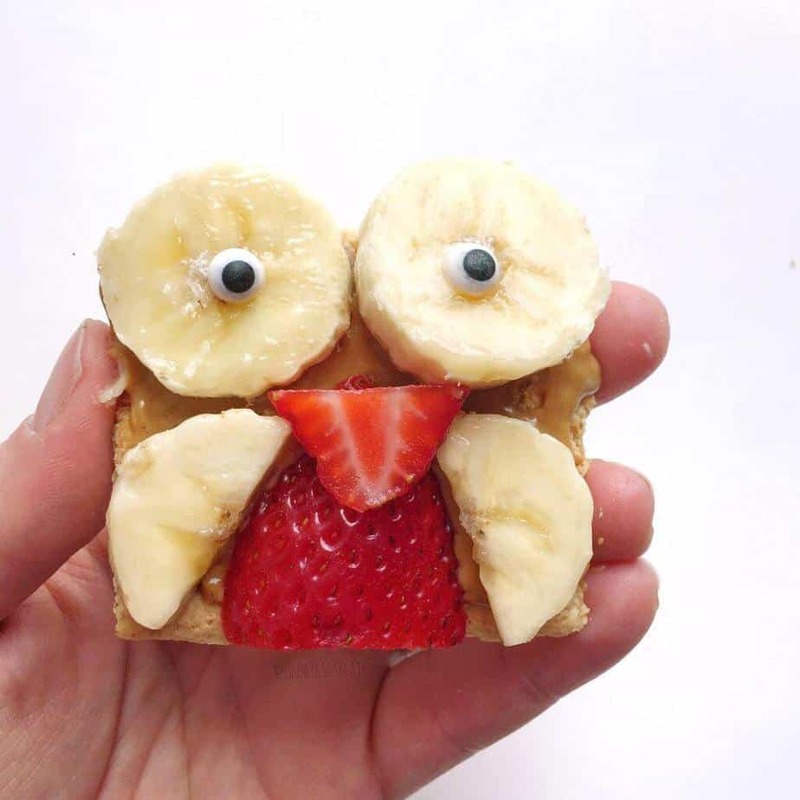 I know my kid got the giggles when she saw this adorable owl snack on her plate and I bet your kid will too! 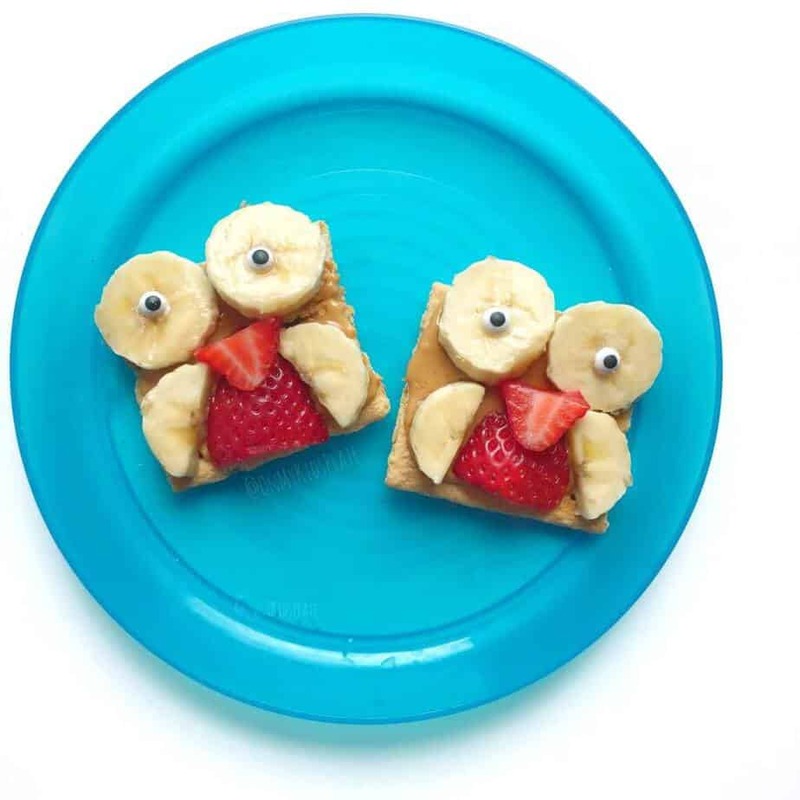 This fun owl snack recipe only takes five ingredients and is totally worth the smiles! I’m a firm believer that food can be fun but not take a long time, which is one of the reasons I really love this snack. Does every snack need to have a cute face that you serve your kid? No, but when you’re feeling up to it? A fun snack like this peanut butter strawberry and banana combo will make their day! It’s one way you can show your kid a little love and surprise them. I love surprises that live in the moment! Kid having a bad day? This will surely bring a smile to their faces. This snack also includes a nice amount of protein, a little fruit, and just the right amount of sweetness that it feels like a treat. If you drink milk, you may want to have a glass handy. For older kids, you can make one and set up the pieces, and let them decorate their own owls. It then becomes a bit of a snack activity! As with most snacks that contain peanut butter, you can easily swap other kinds of nut butter and nut butter alternatives. Almond butter and cashew butter are both delicious too! For a nut-free alternative, try sun butter made from sunflower seeds or wow butter made form soy. You could also use cream cheese if your kid is just not a fan of any nut butter. This quick and easy snack kids snack idea is perfect for afterschool or a birthday party. Serve this no-bake peanut butter and banana owl treat and the kids will love it! Spread a thin layer of peanut butter on two squares of graham crackers. Slice banana into rounds, slicing two rounds in half down the center. The half rounds become wings, add to graham crackers. Add two banana eyes to each cracker. Top with candy eyeballs. Slice the tops off of the strawberries, then slice the strawberry in half longwise. Trim one piece a little shorter. The long slice becomes the belly, and the short slice becomes the beak. This will make two peanut butter strawberry banana owl snacks. the recipe can easily be duplicated to make more for a crowd! So tell me what other kinds of fun animal graham crackers would you like me to create? Does your kid have a favorite animal we could make together into a quick and easy recipe?